C.'s third question about job interviews was most intriguing: How does credible dovetail with chic? The key consideration here is, Is chic relevant in this particular competition? Is it a value or expectation held by the interviewer and his or her organization? As a rule of thumb, if the product or offering of the organization is dependent on design, its employees look commeasurately glossier. Some hiring managers value the attractiveness of those in highly visible roles and so, in an interview, will give points for chic (or just good looks) even if the criterion is not openly acknowledged. Others have few requirements other than neat grooming and attire. If your role requires meeting your prospective company's clients or customers, the interviewer will note whether you would represent the company appropriately. Helene, a women executive whose personal style was instinctively glamorous, was being considered by a global mining company for a senior position which required her to visit countries where their associates had only occasionally met women at that level. For that reason, the executive recruiter advised her to dress conservatively for her interview with the company's directors. She swapped the fitted, sleeveless, above-knee pistachio sheath she planned to wear for a fawn pant suit, appropriate for business travel to the Emirates. (She added her black, yellow and ecru Chanel scarf.) Helene tweaked her hair colour from platinum blonde to a subtler honey, and wore discreet makeup. She was hired; her appearance supported her impressive work history and stellar reputation. Women past fifty will often compete with candidates a decade or more younger, and be interviewed by people the age of their children. So, rather than worrying about chic, focus on current. Rachel, 62, was recently interviewed for a HR job in the healthcare sector by a panel of three persons under thirty. In a rarely-worn gray jacket she'd pulled from the back of her closet, she had a crisis of confidence. "I tried to buy something that would never go out of style, and instead I felt frumpy", she said. She did not get that job, but within a month was in the running for a contract with a cultural institution she revered. She decided to do everything in her power image-wise, because this was her dream job. Rachel bought a dress like the circle eyelet shown at left. She went to the MAC counter for a free makeup lesson, had her teeth bleached, and chose new glasses frames. She had been asked to prepare a PowerPoint analysis of an assigned business case for the interview. Along with her resumé, she had the deck professionally styled by a graphic designer because she wanted every visual she put in front of the interviewers to be crisply modern and coherent. She won the contract. 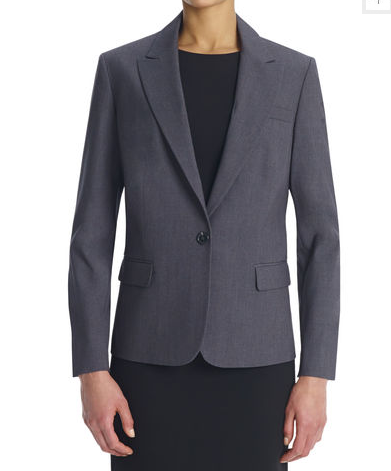 Once on the job, Rachel wore chinos and crisp oxford button-front shirts, but that grey jacket? Fired. 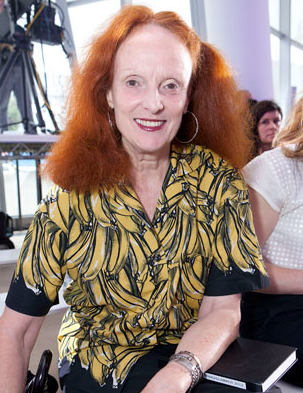 Chic is not a requisite for credibility unless you're gunning for certain jobs—for example, Grace Coddington's at Vogue—and by then you will have achieved your own ineffable charisma. But looking at home in your professional skin is. So relax about chic (for most jobs), but muster, if you can, another quality: The Gleam. Jean-Claude, a shrewd manager who hired tech professionals, said, "I care somewhat about how they're dressed, because they'll be with our A clients. I care about skills, but the environment changes so quickly, we keep training everyone. What I really look for is what I call "the technological gleam in the eye". J-C wanted to see a passion for the work, one of the most impressive qualities anyone, regardless of age or occupation, can bring to an interview. Real credibility, not the candy wrapper of chic, derives from performance. That's why many interviews include a skill demonstration like Rachel's, and why there is a probationary period. However, if chic is your standard, an image consultant or skilled personal shopper might help you with your existing or new wardrobe—but C. hired a consultant and was disappointed, saying "...she age-pegged me; the outcomes were a bit dowdy, sort of complicated...and I just don't like the 'political power-dresser' vibe." And don't forget your beloved friends. Jennifer loaned two suits, a dress and accessories to Anita, a project manager who'd spent four years at home in jeans and yoga pants, nursing her ailing mother-in-law. There is usually a round of interviews, which can tax the returning woman's wardrobe. Anita truly had nothing to wear, and was reluctant to spend on clothes she would not need if she stayed unemployed. Regardless of whether the job entails meeting clients or the public, I think it behooves interviewees to regard recruiters/hiring managers as their "clients" and dress accordingly. And yes to "current." So many jobs rely on keeping up with new technology, and so even if it's not conscious or intentional, you may be judged if your appearance pegs a prior decade. Jackets, yes absolutely. I also think shoes and bags can be another option to send subtle visual cues that one "got the memo." The last two posts are fascinating. With no desire to return to the work world, I still love hearing these stories about what women did to pull together a successful look and get the job. I feel a connection with the challenges I've had buying/dressing for my changed life in retirement. Your blog, as well as une femme and LPC, have been very helpful with all of that. Duchess: Thank you for the last two posts. In reading through them I can see clearly why - even though I was perfectly qualified - I did not land the job-of-my-life for which I interviewed. I believe some subtle updates are in order. I believe it's all about context. There are environments - oil and gas engineering come to mind - where chic might be anathema. Sales and marketing are almost always safer havens for personal style. Chic, which in our personal lives may have a Platonic ideal, is wholly subservient to corporate culture, in the work world. Not to say you can't conflate the two a bit, you can and even should if it pleases you. But the first eye goes to the social signals of your environment. As you pointed out, of course:). Fascinating. Your examples are perfect--reminders that we are all dressing for a part, and an audience, one way or another. Good suggestions here. But, looking at the Boden dress, I wonder why the Boden people thought it was a good idea to show the model with her finger in her mouth - ugh! Do they suppose it's "cute"? une femme: A jacket raises the "authority quotient" of an ensemble but a polished dress looks great, too. LauraH: The stories are true, and I have many more! Indigo Dragonfly: Very satisfying when a lurker comments! I'm sorry that opportunity did not work out and hope there are others. LPC: You reminded me of a civil engineer I knew who always stuck a flower decal on her hard hat and kept medium height heels in her bag, into which she changed minute she left job sites. C.: I'm always a little surprised by women who maintain they dress for "no one but myself". They may intend and believe that, but to not take the audience into consideration can sometimes create unwanted results. Rita: I would describe her finger as at her lips- or maybe on her teeth? Yes, odd pose. I'm very much enjoying looking back at some of your wealth of posts - I'm looking for a coat, ideally thrifted but I doubt I'll get lucky - and looking at a wealth of woollens and the updated LLBean "riding coat". (and, of course, their duffel coat...). All your interview advice is very helpful, but sadly, it means that many people who need the work positions the most could not succeed in the interview, as it simply costs too much to buy such new clothing if one is unemployed or in precarious employment. I'm not saying that to be petulant, but because it would be important to find accessible solutions. Not everyone has a female friend the same dress size and who needs "interview worthy" garments in her wardrobe. lagatta: Remember the question that formed these posts was asked by a specific woman, for a given job. Dress for Success is similar; I see on their website they are about to announce a Montréal affiliate. I don't agree with your statement about friends; at least ten women I know here could and would help me put myself together, either from their own closets of friends-of-friends. Women can do this. Your advice is especially timely, dear Duchesse, and I'm grateful to you. After a few years of working from home and teaching in students' homes, this fall I'm going to be teaching and training in companies. So while I don't need to interview, I do want to polish my look a bit. I'm going to sew up a couple of shift dresses in printed knits and a make a modern jacket that will work with both. The challenge is going to be finding a pair of attractive, appropriate shoes that my newly-acquired orthotic will fit in. The hunt begins tomorrow! rubi: Ohhh, printed knits! I hope you show us your dresses. 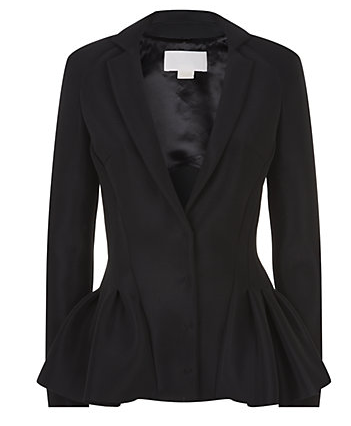 That Antonio Berardi jacket: Want! (Well, before I looked at the price! Somebody tell me there's a similar pattern?) Have really enjoyed these last two posts and your astute advice. I'm glad I'm not in the job market, and that my days of pitching to business clients allowed for some arty flair in dress. Great stuff here too. And the opposite applies to the stay 'current'advice for very young applicants. Interviewing graduates, I'm a bit turned off if they turn up in very trendy stuff (especially if it's retro from a decade that I wore the original of). For entry-level jobs, I think 'classic' is a good adjective to go for. (And this has nothing to do with the cost of the garments - charity shops, cheap chain stores can provide very nice outfits if you look hard). Beth: Time to get that judy! Eleanorjane: As for the young 'uns, a friend's 27 yr old just had tattoo removal to prepare for her first job in a financial institution. That was the girl's idea (both getting them and having them removed.) She wished she had thought more about where they were placed (forearm, both outer calves) six years ago. When I decided to go back to work, I was overweight by a large amount, had no good clothes and no confidence. I had what I learned to call"practice interviews" but until I found the right clothes and got the confidence back it never worked for me. It was not a price point, it was feeling good in the clothes and the weight. fmcg(If I may call you thus): You have made a point I wish could be communicated to all mature women who are embarking on a job search after a period out of the workforce. The importance of personal presentation varies by occupation and organizational culture, but its effect on confidence is across-the-board. Sounds like you did achieve your goal, and that's so heartening to read. I just love that jacket. I used to have a couple in that style when I worked in the corporate market. I do think that first impressions are extremely important for a job interview. We make value judgements about people within the first 2 minutes whether we admit it or not it is hard wired into our neurology as part of the fight or flight mechanism. As a coach and image consultant I used to help many of my clients prepare for interviews and important presentations. A little effort make such a difference.